Over time, water may leak through tiles and into the walls or floors causing serious damage to surrounding areas. 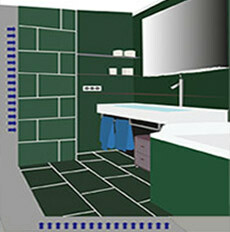 ARCACEM S2 is an ideal solution to waterproof under bathroom tiling. Arcacem S2 is recommended for waterproofing a terrace under tiling. A flexible waterproof membrane, it will prevent water infiltration into rooms underneath the terrace. Arcacem S2 is recommended for waterproofing cracks in fountains, swimming pools or in basements. Used with a reinforcing fibreglass mesh, ARCACEM S2 provides a waterproof coating highly resistant to water pressure and cracking. ARCACEM S2 is designed to waterproof a wide variety of masonry and concrete substrates, providing long term resistance to water pressure. ARCASEM S2 is perfect for waterproofing bathrooms, showers, balconies, terraces, swimming pools, etc. before laying ceramic tile finishes. perfect for waterproofing bathrooms, showers, balconies, terraces, swimming pools, etc. before laying ceramic tile finishes. very little extra thickness or weight to your original surface (important if door opens onto the terrace or behtroom surface or if builiding regulations limit the weight. 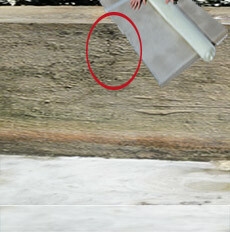 Arcacem S2 is used in conjuction with Arcacem to waterproof over active cracks. The added flexibility and reinforcement with Arcafibre is resitant to movement and water pressure. Arcacem S2 can be applied horizontally, vertically or from underneath the surface to cement and concrete blocks, aerated concrete, traditional masonry, poured concrete, agglomerated masonry blocks, wood and tiling. A cement based waterproofing system consisting of hydraulic binders (cement powder, aggregates and chemical additives) and resins in dispersion, ARCACEM S2 renders a flexible, non toxic, waterproof coating highly resistant to abrasion and erosion. When using ARCACEM to tank a basement or swimming pool, cracked areas (unstable, active cracks in the substrate) should be treated with ARCACEM S2, which is more flexible, and reinforced with ARCAFIBRE. The ARCACEM S2 + ARCAFIBRE application is easily feathered into the ARCACEM application. With its components pre-batched and packed, ARCACEM S2 is easy to mix and apply to achieve an elastic waterproofing coating which adheres perfectly to wet or damp surfaces. Use ARCASTOP before applying ARCACEM S2 if a major leak or running water is present. Do not apply under direct hot sun (apply in the morning during the summertime) or on a hot surface. Do not apply ARCACEM S2 on frozen substrates or if freezing temperatures, strong winds and/or rain are forecast within 24 hours. The surface must be clean, sound, and free from all free of loose or friable materials. Eliminate all residues of cement and cement mortar, level gravel surfaces and fill in all holes. 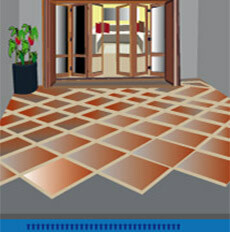 Laitance, residues 1 to 5 mm thick of mortar, tile cement or joint cement, often exists on flooring and walls. It must be thoroughly eliminated before using ARCACEM S2. Floors: When foundation is poured, the water rises to the surface and the laitance can be several millimetres thick. Walls: Use a pressure washer (such as a Kärcher) 20 cm from the surface to open the pores of the cement and permit mineralization. For use over tiling: ARCACEM S2 can be applied directly on old tiling and new tiling can be placed on the ARCACEM S2. This is especially interesting where old tiling is difficult to eliminate and there is room for an extra thickness on top of the tiling (for the ARCACEM S2 and new tiles). Tiling should be rubbed raw through abrasion or sanding before applying the product. For use on plaster: use primer such as ARCALATEX diluted 20% (plaster is not compatible with cement). Never glue tiling directly on plaster surfaces with a cementitious glue. Use a vinyl glue. The surfaces must be wet down the day before to guarantee good penetration of the product. Never apply ARCACEM S2 on a surface where running water is present. Pour the resin into a large container. Stir in the powder slowly and progressively, mixing with a low speed electric or pneumatic mixer to obtain a smooth homogenous liquid paste. Let sit a few minutes before applying. Apply with a smoothing trowel or brush. A brush application is recommended as it will create a massaging effect which will cause the product to penetrate the pores of the substrate and will not create bubbles. To spray mechanically, use a low speed air power machine equipped with a nozzle 8mm in diameter. Project the product in even coats (covering the whole surface without excess layering). Smooth with a trowel or brush to eliminate bubbles. ARCACEM S2 is applied in 2 coats minimum.Wet down the surface before application but not between coats. Note: The surface should be damp not running water wet. Treat all major leaks or excess water ingress prior to application - (see Annex 2 to treat). Do not apply under a hot direct sun or if dry wind is present. Let the 1st coat dry approximately 8 hours before applying the 2nd coat. Drying time will vary depending on temperatures and climatic conditions (from 1 to 15 hours). At 20°C it will dry in 2 hours. On a damp but not excessively wet surface, apply ARCACEM S2 in 2 coats. 1st coat: 2 kg per m2 or 2.5kg per m2 if the reinforcing fibreglass mesh is used. 1st coat: 2.5kg per m2 In this case, usage of the reinforcing fibreglass mesh must be applied between the 2 coats. 1st coat: 2.5kg per m2 The reinforcing fibreglass mesh must be used between the 2 coats. Use a glue adapted to laying tile. Balconies and terraces: The surface must be clean, sound, and free of loose or friable materials. Wet down to obtain a damp surface (not running water wet). A slight slope (2 to 5%) is recommended. Foot traffic will be possible within 3 days (drying at 20°C with favourable weather conditions). Once the ARCACEM S2 has been applied, we recommend applying a water repellent treatment such as ARCABLOCK. Old paint must be thoroughly stripped and removed. The surface must be wet down to make it damp before application. Tiling may be applied around the pool to obtain the colour reflection desired (green, blue or other) using a flexible glue for tiling. Always apply on a damp surface (not running water wet) in the shade (not under direct hot sun). Wait 14 days before putting water into the swimming pool. Rinse the ARCACEM S2 surface with a pressure washer. Verify the pH and correct if necessary to obtain the recommended pH level. Never use copper based anti-algae products (which will leave green staining). The ARCACEM S2 system must only be used where water has a hydrometric classification as TH or hard cloth. Never use in a swimming pool filled with aggressive soft water. Do not use where in contact with solutions where the ph<6. ARCACEM S2 can be covered with paint or tiling glued with an adapted flexible glue. Will keep 1 year stored in unopened containers in a clean, dry area. The coverage rate will vary according to the substrate and use. Drying time will vary depending on temperatures and climatic conditions. Follow the instructions indicated above and depending on the type of waterproofing desired.